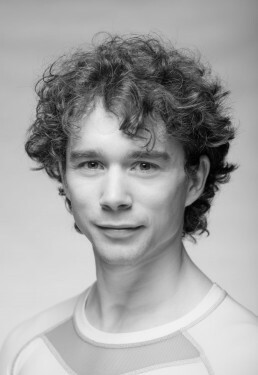 Hungarian born, István Simon is a Principal with the Semperoper Ballett and trained at the Hungarian Dance Academy. He successfully participated in several competitions, his awards include Best Graduation Student of the Year – Hungarian Dance Association (2007), Gold medal International Ballet Competition Helsinki (2005), Grand Prix Prize VIII. International Competition of HDAA (2005), Finalist Prix de Lausanne (2004), Gold Medal International Ballet Competition Brno (2003) and the Gold medal at the International Ballet Competition St. Pölten (2002). István is also a Guest Artist of the Hungarian National Ballet and has appeared in several international ballet galas such as the 30th Rudolf Nureyev International Ballet Festival at the Kazan Opera, Russia where he performed REMINISCENCE with Dorothée Gilbert (Étoile Ballet de l’Opéra de Paris) and the world premiere of Concerto For Two (Craig Davidson). His repertoire includes roles such as Des Grieux in Manon (Kenneth MacMillan), Lucentio in The Taming of the Shrew and Lensky in Onegin (John Cranko), Solor in La Bayadère, Desiré in Sleeping Beauty (Aaron S. Watkin after M. Petipa), Siegfried and creating the role of Benno in Swan Lake (Aaron S. Watkin after M. Petipa & L. Ivanov) The Cavalier and creating the role of The Nutcracker Prince in The Nutcracker (Aaron S. Watkin/Jason Beechey after M. Petipa) and creating the role of Miguel in Don Quixote (Aaron S. Watkin), James in La Sylphides (August Bournonville), Etudes (Harald Lander), Grand Pas Classique (Victor Gsovsky), Principal couple in Theme and Variations and Emeralds from Jewels, Apollo and Franz in Coppélia (Balanchine), Romeo in Romeo and Juliet (Stijn Celis), Tristan in Tristan und Isolde and Albrecht in Giselle, The World According To Us, On The Nature Of Daylight, The Grey Area, A Million Kisses To My Skin and Reverence (David Dawson) and In The Middle Somewhat Elevated, Impressing the Czar, Enemy in the Figure, The Vertiginous Thrill Of Exactitude, The Second Detail and Artifact Suite (William Forsythe). Additionally, throughout his career he has been involved in numerous creations and Principal and Soloist roles in works by Jirí Kylián, Alexei Ratmansky, Mats Ek, Alexander Ekman, Wayne Eagling, Ohad Naharin, Johan Inger, Jacopo Godani, Jiří Bubeníček.